It has been declared a public health emergency in the U.S., one that claims over 130 lives every day. With more than 11.4 million people misusing prescription opioids, and hundreds of thousands turning to heroin for the first time, Overdose goes to the heart of a crisis that is grappling an entire nation. Exploring the devastating consequences opioid misuse and heroin addiction is having on communities large and small in the United States, Overdose explores how law enforcement officials and public health professionals are fighting to curtail an epidemic that has no clear end. Through intimate encounters with drug users, addicts, paramedics, police officers and family members all entangled in the opioid crisis, Overdose reveals what life is like for those who have been viciously shaken by a problem that’s devastating communities large and small across the United States. Overdose was directed by Jason Motlagh and Mark Oltmanns. Motlagh gave us some insight into production. What attracted you to the story of Overdose? Opioids killed more Americans in one year than the entire Vietnam War. And the crisis is only growing worse, as more powerful drugs hit the streets. There’s been some excellent media coverage about what’s driving the addiction epidemic, the role of predatory drug companies and the plight of the addicted. But the scale of the crisis is still not fully appreciated by U.S. policymakers. This is a national public health emergency. Natural disasters that affect a fraction of the population are handled with an urgency that transcends politics. This should be no different. It’s incredible that our government has yet to put forward a comprehensive strategy to deal with the opioid crisis. We immerse ourselves in the world of our subjects. Because we work with a light footprint — minimal personnel and gear — and don’t cling to plans or schedules, we’re able to follow the current of the story wherever it leads us. Our job is to listen, keep our eyes open and the camera rolling. There’s no stereotypical opioid addict. Every strata of American society is under siege: poor and rich, urban and rural, black and white. No family is immune. There’s a tendency in this country to dismiss drug addicts as weak or less worthy of help. If this stigma persists, we’re in a lot of trouble. Our goal in making this film was to reframe the way we look at the addicts among us. By tracking the descent into addiction and impact on loved ones and communities, we hope viewers will see them as people with a sickness in need of care and support, not scorn. Under a downtown bridge, Jason Motlagh sits with a man whose addiction has led him to lose his family, job and home. A mother visits her daughter’s grave. She died at 19 from a drug overdose. A police officer doing a vehicle search comes across drug paraphernalia. A man who lives under a bridge is taken to the hospital, after a near-fatal opioid overdose. In the streets of Cincinnati, Ohio, paramedics arrive to revive a man who is unconscious from an accidental drug binge. An addict prepares to shoot up. A small pebble of fentanyl next to a crushed soda can is enough to provide a strong high. The synthetic opioid is 80-100 times stronger than morphine. In downtown Middletown, factories have closed, cutting the city’s economic lifeline and making residents vulnerable to drug use. In 2017, the city recorded nearly 1,000 opioid overdoses, one for every five of its residents. In southwest Ohio, a community gathers to remember victims of the crisis. Every day, more than 130 people in the U.S. die after overdosing on opioids. DATA ON OPIOID EPIDEMIC IN THE U.S. Since the 1990s, more than 351,000 people in the U.S. have died from an opioid overdose. The Centers for Disease Control (CDC) defines the problem as multi-layered, across three distinct waves. 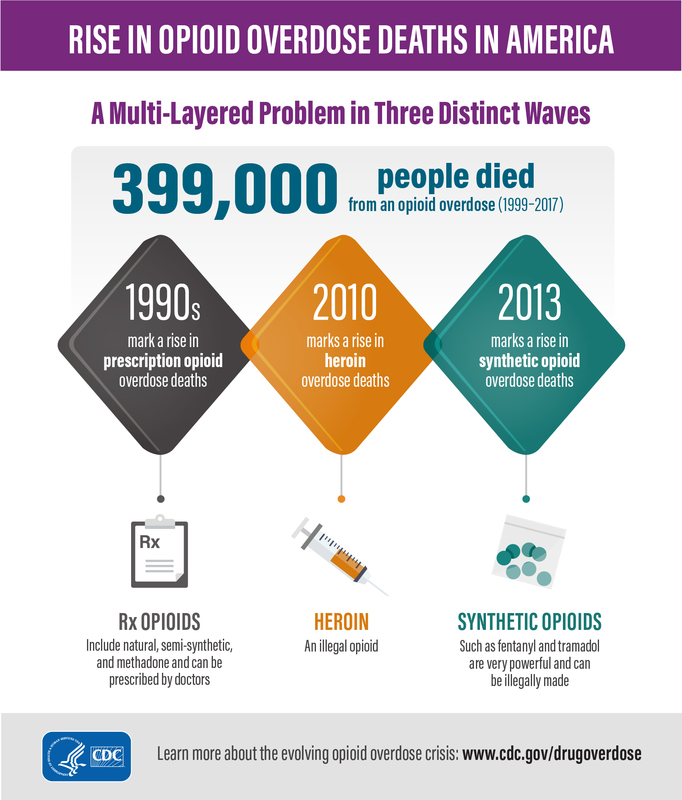 THE THREE WAVES OF THE OPIOID CRISIS FROM CDC. Opioid overdose deaths in the U.S. continue to climb. Whether they are from synthetic opioids (like methadone), commonly prescribed opioids (like fentanyl) or heroin, the rates of overdose deaths today are five times higher than they were nearly twenty years ago. In the United States, the National Institutes of Health and the National Library of Medicine – the world’s largest medical library – have teamed up to provide resources for treatment and care of opioid addiction.